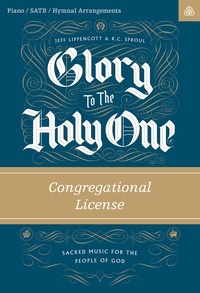 A congregational digital license for the piano and SATB arrangements of select tracks from Dr. R.C. Sproul’s sacred music project, Glory to the Holy One. This album is a collection of beautiful hymns written by Dr. Sproul, wedded with soaring melodies written by award-winning composer, Jeff Lippencott. This project provides the church with an offering of that which is good, true, and beautiful in the Christian faith.